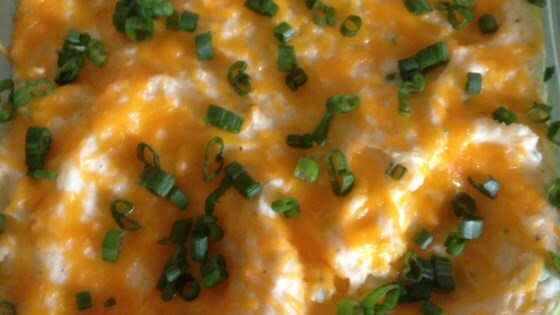 "Whipped potatoes with cheeses! Delicious!" Place potatoes in a large pot of salted boiling water, bring water back to a boil. Cook until potatoes are tender, approximately 15 to 20 minutes. Drain well. Let cool. When potatoes are cooled, cut them into small chunks. Using an electric blender, whip potatoes with sour cream, cream cheese and garlic salt. Place mixture in a 9x13 inch casserole dish. Sprinkle with Cheddar cheese. Pretty good but FAR too rich. I would cut the cream cheese at least in half. This was a great change from mashed potatoes. I did make some minor changes though. Instead of cheese I use a bread crumb mixture for the topping. Also, I used half the amount of cream cheese. I added ranch dip mix and it was delicious!